We recommend you choose a file type that most peoples' computers can open and view. If you create a file in Word or Excel, for instance, you might consider saving them as .pdf or .htm/.html. All file type uploads are limited in size to 4 MB per file. 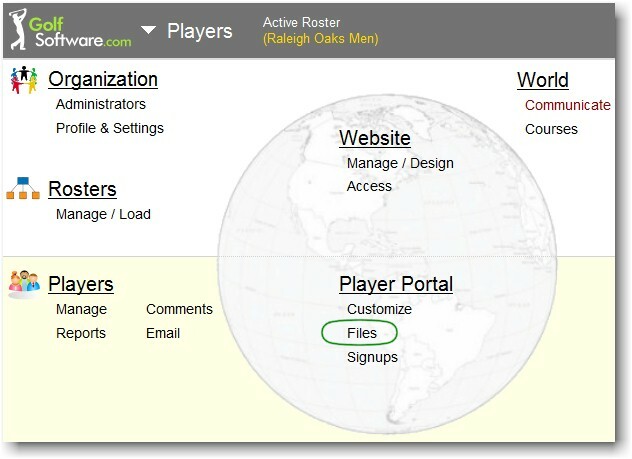 The number of files your group can upload depends upon the level of subscription (Par, Birdie, Eagle, etc.) you have. Most computers have a free .pdf reader such as Adobe Acrobat installed. Virtually all computers have a browser (Internet Explorer, Firefox, Chrome, Safari, etc.) installed for viewing web pages. Digital photos are typically in this format. People who have (97~2003 versions) Excel, or Microsoft Office, installed on their computer can open and view. People who have (2007/2010 versions) Excel, or Microsoft Office, installed on their computer can open and view. People who have (97~2003 versions) Word, or Microsoft Office, installed on their computer can open and view. 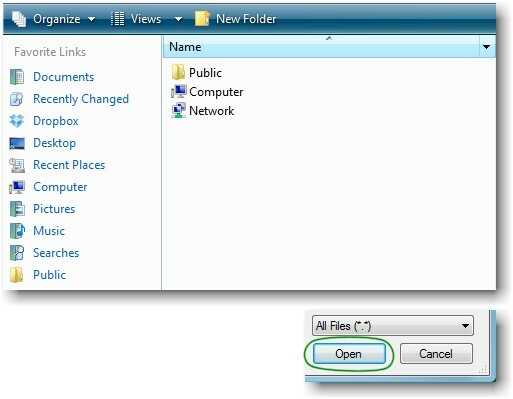 People who have (2007/2010 versions) Word, or Microsoft Office, installed on their computer can open and view. 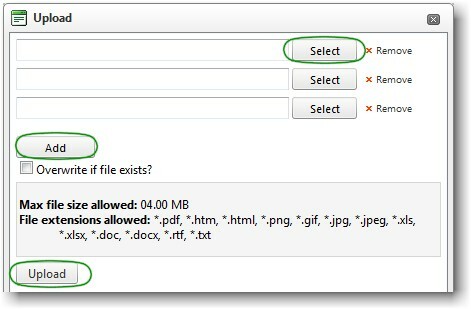 Click on the green plus icon to upload files (see circled below). Currently it says "3 files uploaded." As you add more that count increases. Click on one of the three "Select" button to select a file from your computer. Find and double click on a file, or highlight and click on the "Open" button to designate the file to upload. The file name will be inserted in the rectangle to the left of the "Select" button (image above). You can select up to three files by using the three "Select" buttons. If you need to upload more, click on the "Add" button to add one more "Select" button. When you have finished selecting files to upload, click the "Upload" button. Add folders, folders within folder, and use the green left/right arrows to organize your information. The folder structure is very similar to that which you would find on your own computing device. The Refresh icon updates (refreshes) the folder view. If you upload a file and don't see it, click on the Refresh icon. Add a new folder. You can drag and drop folders inside other folders for organizing. When you are inside a folder and click on the Add icon, the new folder will be inside the current folder. The red "X" is for Delete like most Windows programs. Highlight the file or folder that you want to delete and click on the Delete icon or press your Delete key on your keyboard. The green plus sign is to Upload files. The little boxes to the left of folders contain a plus (+) sign or a minus (-) sign. Clicking on a plus sign opens the folder and the minus sign closes the folder.